You’ll be able to open an online account, which you can pay into to cover the cost of childcare with a registered provider. This will be done through the government website, GOV.UK. You’ll be able to apply for all your children at the same time, when your youngest child becomes eligible. All eligible parents will be able to join the scheme by the end of 2017. You do not have to switch to Tax-Free Childcare if you do not wish to. Employer-Supported Childcare will continue to run. The current scheme will remain open to new entrants until April 2018, and parents already registered by this date will be able to continue using it for as long as their employer offers it. 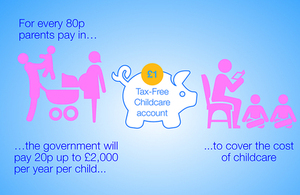 However, Tax-Free Childcare will be open to more than twice as many parents as Employer-Supported Childcare.